Portree is the first major port of refuge after arriving in that northernmost region of Scotland, the craggy, windswept landscape that constitutes the Isle of Skye. It is very beautiful and the two days we spent there, waking up each morning to long days of full sun, were idyllic. Some weeks later, on a plane, I watched the opening scenes of Prometheus and recognized familiar scenery - a team of scientists emerges from tents dotting the hillside surrounding the Old Man of Storr and enter a cave to find evidence of Prometheus, the first society. Having been there myself, I buy it. 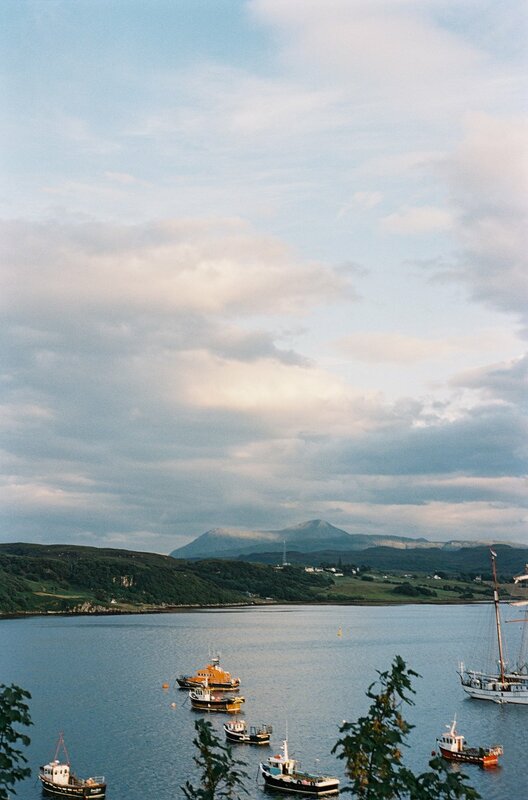 On the day we arrived in Portree, we arrived right as the sun began to set, the surrounding hills and tiny cars silhouetted against a quickly purpling evening sky.